Listings that you create are organized by Categories. Each listing can be assigned to one or more categories. 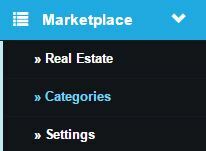 To create or edit a category, click on the Categories tab under the Marketplace section of your admin panel. The categories overview section will display your current categories and the type of listing they are associated with. From here you can create new categories and edit or delete existing categories. When creating or editing a category you will need to provide a Title for the category, a Description, and choose the Type of listing that this category will be associated with. You will also be able to select users to receive copies of lead notifications if a form is completed on a listing that is assigned to this category. This does not change lead distribution for the form used on your listings. Only additional copies of notifications are delivered to these users. When you have completed the above fields, be sure to click the Save button in the upper right corner.